Every October members of the Moapa School FFA Chapter in Nevada spend a few weeks picking pomegranates. The crimson fruit, native to the Mediterranean basin and the Middle East, also thrives in the desert Southwest. The ease of cultivating the exotic fruits led Moapa Valley High School in Overton, Nev., to plant a small – but growing – pomegranate orchard. 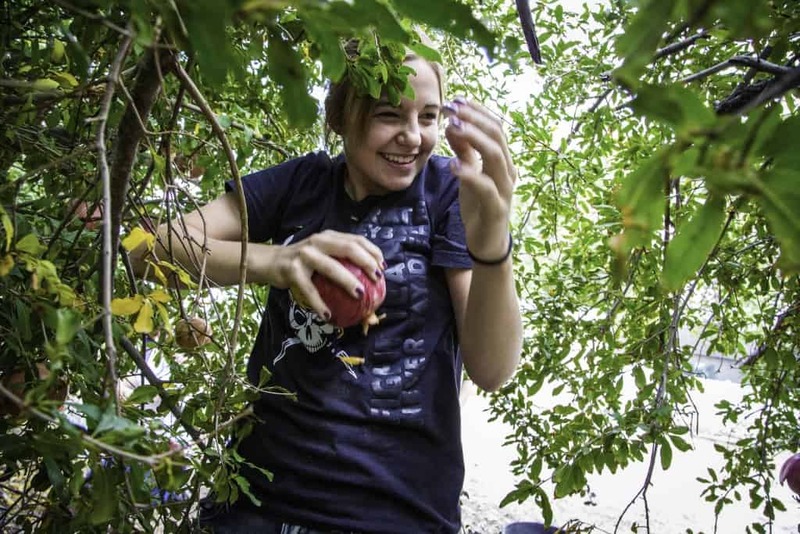 In addition to 1.5 acres of trees planted on campus, students also harvest fruit growing in a pasture leased from the University of Nevada Cooperative Extension. 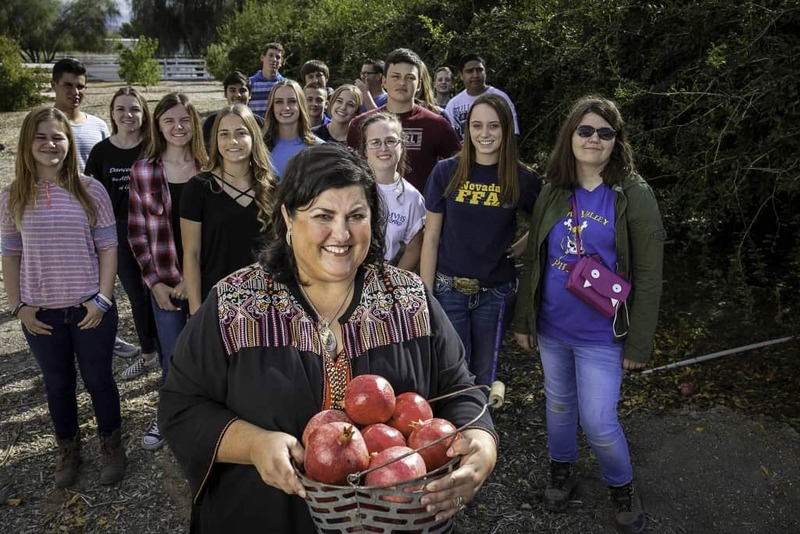 O’Toole believes her FFA chapter is the only one in the nation with a pomegranate orchard. 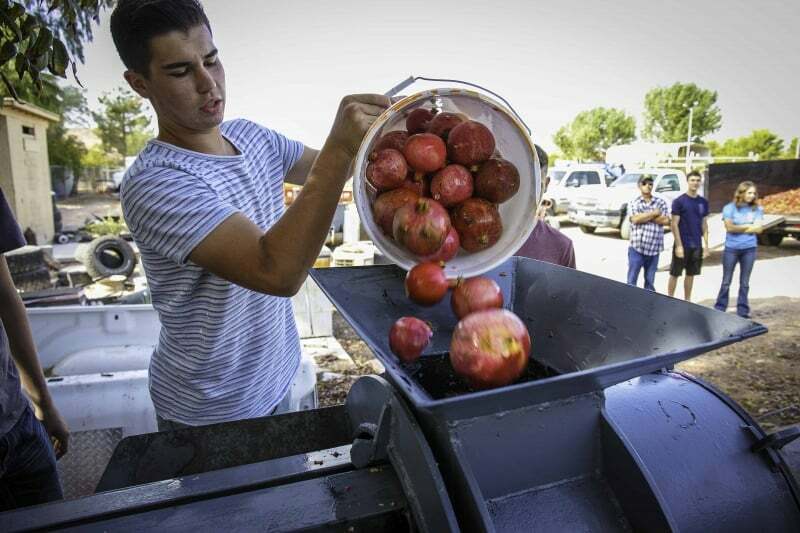 The local community clamors for the tangy fruits, purchasing bags of fresh pomegranates from the FFA-run Moapa Valley High School farm market (operated on an honor system) and a booth set up at the annual Pomegranate Art and Craft Festival held in Overton each November. Last year, students sold out of pomegranates on the first day of the Pomegranate Art and Craft Festival. 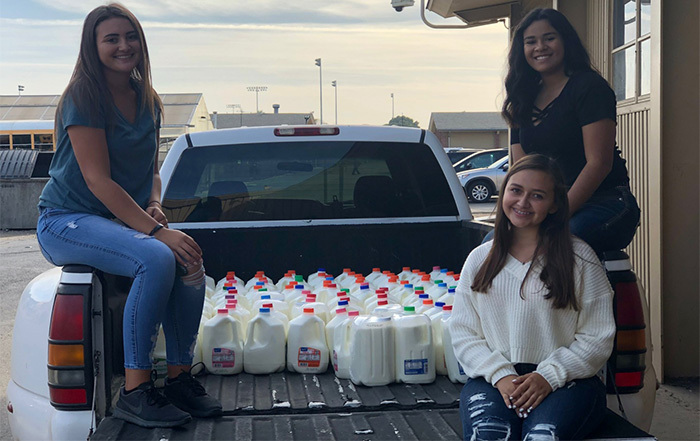 The funds raised through festival and farmers market sales help purchase seed, feed and supplies for the Moapa Valley High School farm and support FFA programming. 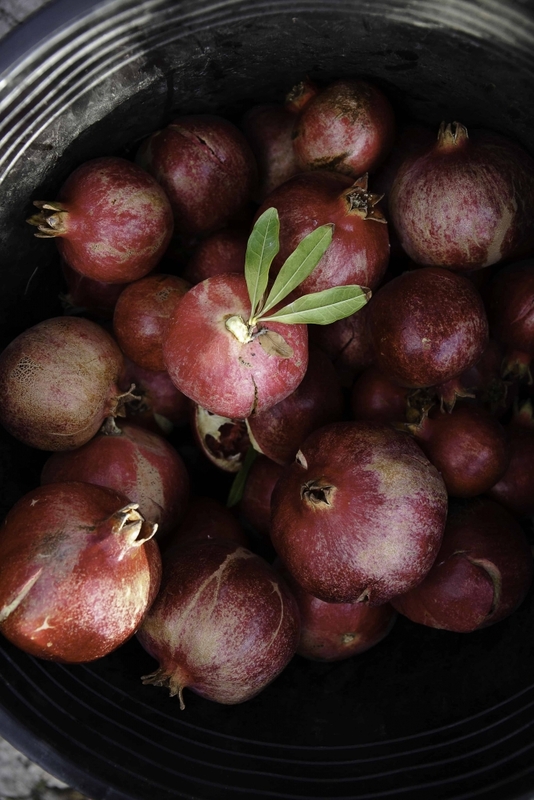 Although the pomegranate orchard is unique, it’s just one element of a standout school farm. 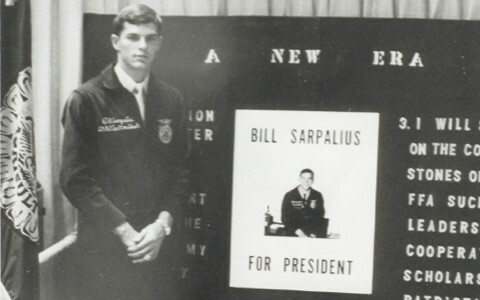 The Clark County School District purchased the 40-acre farm in 1958 to complement the classroom experience. 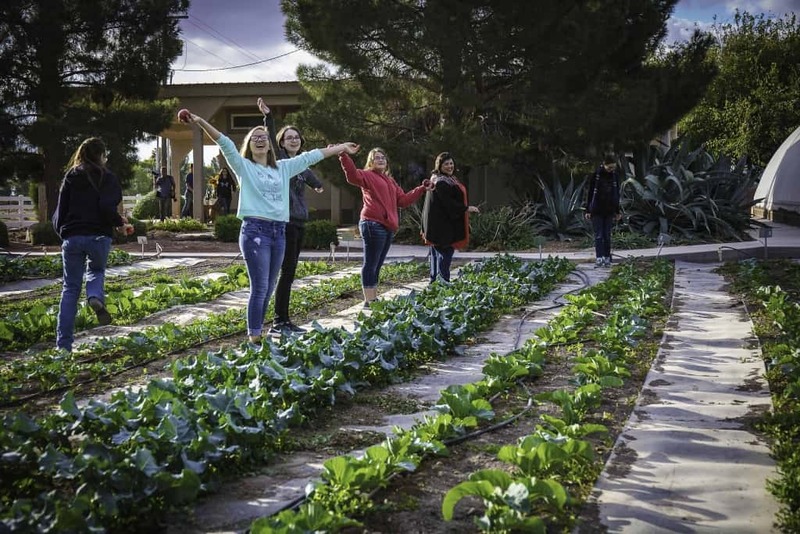 With the support of a farm manager, agriculture educators and students, the farm at Moapa Valley High School rivals some of the most successful small-scale diversified farms in the nation. The operation includes 20 Angus-cross cattle, laying hens, alfalfa hay, vegetable gardens and, of course, the pomegranate orchard. 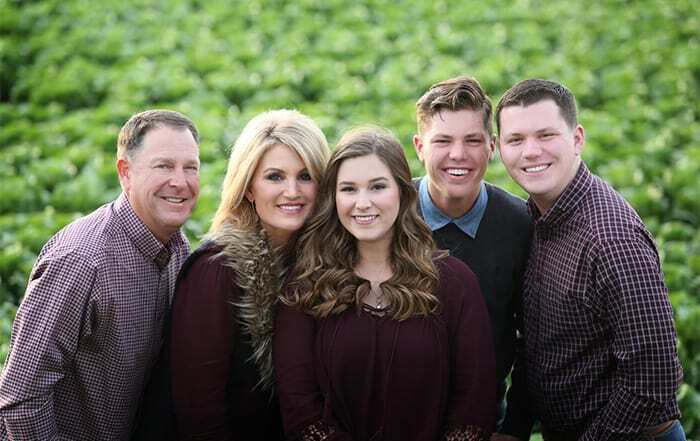 O’Toole oversees the agricultural education program while her husband, Kevin O’Toole, works as a full-time farm manager, supervising FFA members on the farm. 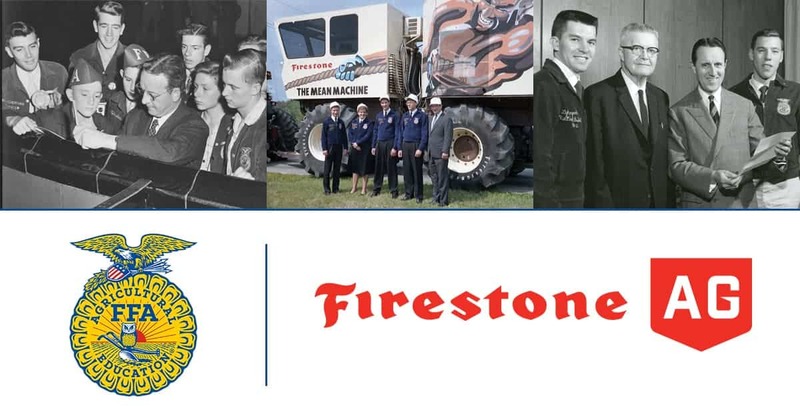 FFA members are engaged in all aspects of running the operation – from planting and harvesting to assisting with artificial insemination of the heifers and selling crops. 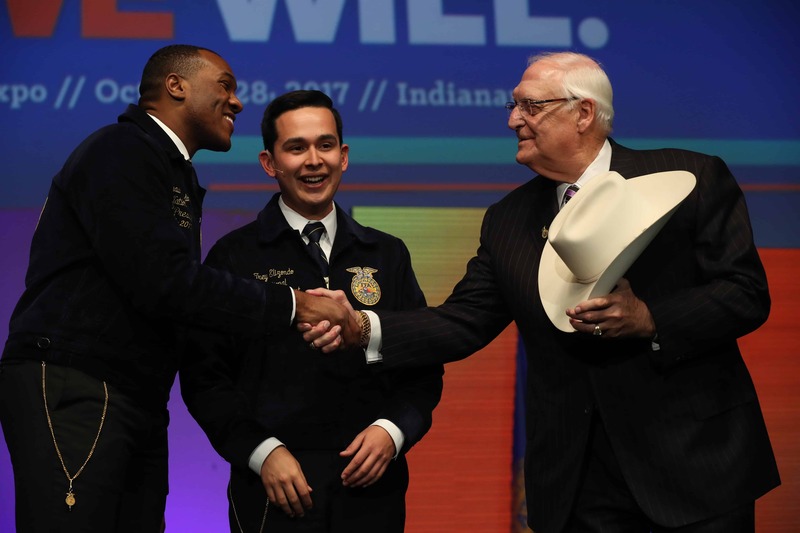 The sheer size of the farm and the opportunities for hands-on learning that it provides set the agricultural curriculum apart from other FFA chapters, according to O’Toole. The weather also makes the FFA chapter distinct. Thanks to the scorching desert temperatures, the farm at Moapa Valley High School is almost dormant during the summer months when other school farms experience their peak seasons. The heat forces the school to close the greenhouses from June to September, but a small group of students helps with tasks like growing alfalfa and managing the cow/calf operation. In a region with a limited number of farms and few students growing up in farm families, the school farm provides opportunities to learn about agriculture. 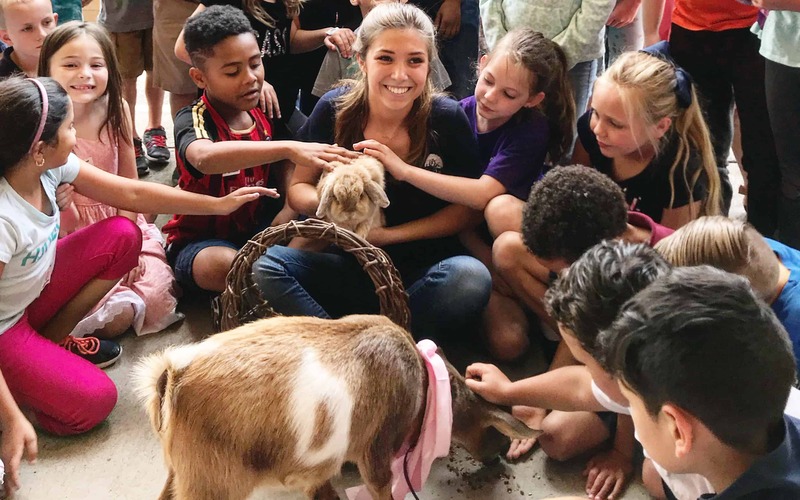 O’Toole wants to do more than teach FFA members about agriculture; she also wants those students to share their knowledge – and the school farm is at the heart of that mission. 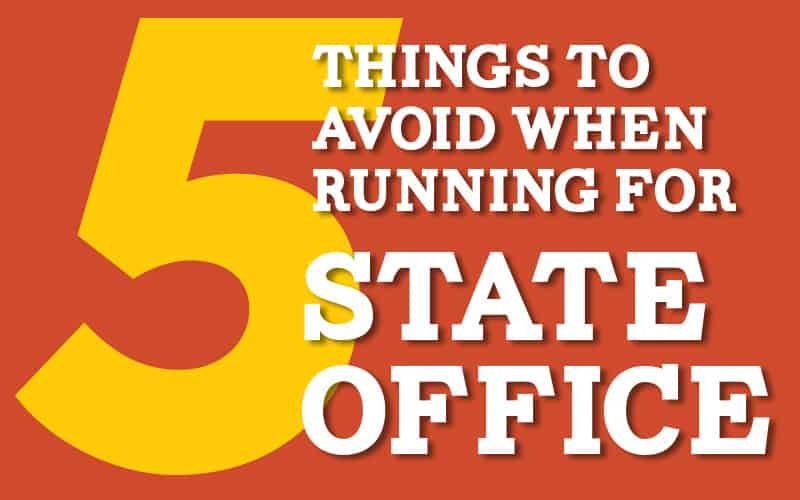 Students have led tours for distinguished guests from the school district and local and state governments, but school groups are their favorite visitors. Thousands of students have toured the Moapa Valley High School farm. FFA members lead school children through the pumpkin patch, greenhouse and chicken coops. The school also partners with local organizations, such as Farm Bureau and Young Farmers and Ranchers, to teach children about dairy farming through activities like milking a demonstration cow and churning butter. Since taking over as ag educator at Moapa Valley High School in 2012, O’Toole has worked to take a thriving program and expand it to offer even more opportunities to students. e farm now has a hydroponic greenhouse and straw bale classroom as well as practical upgrades such as a new cattle chute and irrigation system. 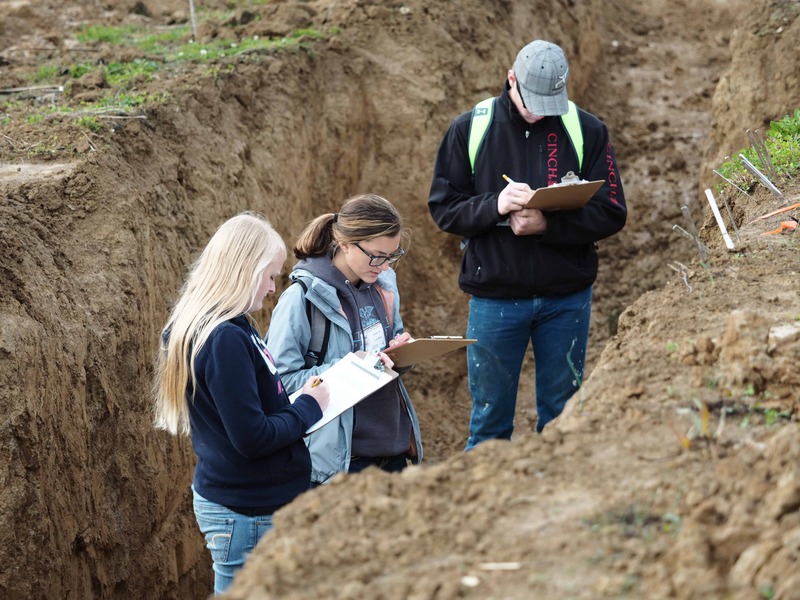 One of the most exciting plans involves combining food science and agricultural education. In the past, FFA members have turned the fresh pomegranate harvest to make pomegranate juices and jellies. 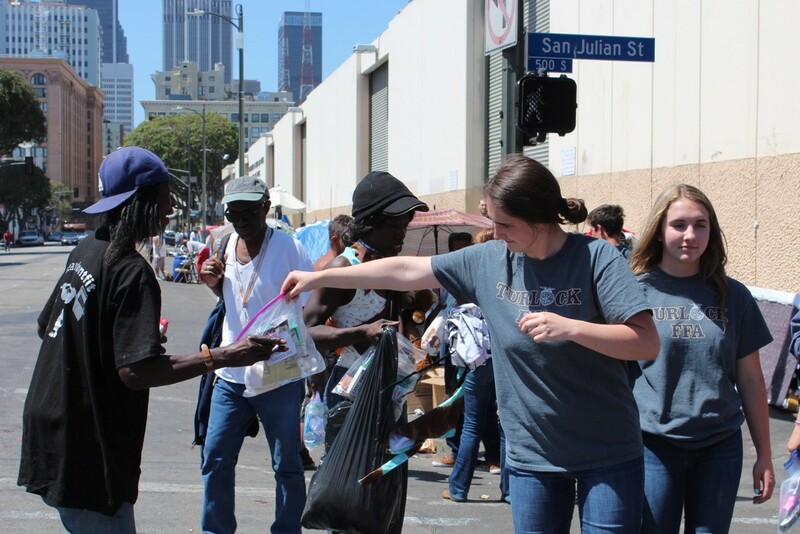 Students often feature the fruit in their supervised agricultural experiences, leading O’Toole to explore more opportunities to incorporate pomegranates into the curriculum. Moapa Valley High School might be the only school in the country growing pomegranates on its campus. Here are some surprising stats about its orchard.